As a steward in God’s vineyard, we must plan for the distribution of our assets upon our deaths. 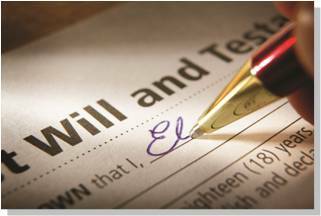 The easiest way to do so is through a WILL, prepared with the aid of a lawyer. A WILL guarantees that the resources we leave behind are distributed according to our wishes, enabling us to continue our support for the charities or organizations closest to our hearts. A "Legacy Gift" is when you make a gift through your will. The most common option is to give cash. It is also the easiest option. You simply write down the amount of the Legacy Gift in your will. There are many options as described below, for giving a legacy gift. PLEASE DISCUSS THIS MATTER WITH MEMBERS OF YOUR FAMILY. "I give $_____ to Campaign Life Coalition". You can give gifts of stocks, real estate or other assets. We suggest you consult your lawyer if you prefer non-cash legacy gifts. You can make a legacy gift of part or all of the estate by writing it in your will. "I bequest ____% of the residue of my estate to Campaign Life Coalition". "If none of the individuals I intend to benefit from this will are alive or otherwise capable of benefiting, I live the residue of my estate to Campaign Life Coalition". Campaign Life Coalition will provide you with access to pro-life lawyers who will help you determine and organize your Planned Giving arrangement. Please contact us at 800-730-5358 or 416-204-9749.